It’s a hot afternoon in Singapore, but we’re in the midst of someone effortlessly cool. Perhaps it’s the way he’s adorned in an orange silk shirt that looks like it can go from bed to runway. Maybe it’s how his platinum blonde hair glistens under sunlight by the window. Or maybe it’s because he’s simply Troye Sivan. At all of 23-years-old, the YouTuber turned pop sensation is all grown up; embracing his brink of adulthood with fervour. Since his musical debut in 2015 – with the understated and introspective Wild EP and Blue Neighbourhood album – Troye Sivan has catapulted to teen pop royalty status alongside the likes of Lorde, Dua Lipa and Shawn Mendes, and became one of the bold faces at the forefront of an increasingly pro-LGBTQ pop culture generation. While it isn’t his first visit to Singapore – the Aussie lad previously visited with fellow YouTubers like Tyler Oakley as part of 2014’s YouTube Fan Fest – it’s the first time he’s dropping by as Troye Sivan, The Pop Star. His gradual ascent to superstardom unsurprisingly warranted a fan frenzy everywhere he went during his Singapore stint, which included an intimate fan signing session and album listening party. But a very public bike ride around the city documented on his Instagram stories proved that fame hasn’t gotten to his head, instead embracing ‘normalcy’ as much as possible. In fact, he tells us that he much prefers to keep a low-profile (he cites RuPaul’s Drag Race and Thai food as the “perfect night in”) – an eyebrow-raising choice of lifestyle coming from one of music’s youngest and fastest-rising musicians. It’s a trait he shares with close friend Ariana Grande as well; their kinship and similar perspectives on growing up under the scrutiny of the public eye captured succinctly on their latest collaboration ‘Dance To This’ – a laidback anthem celebrating anti-celebrations. The songs off Bloom are equivalently honest and accurate as they flesh out Troye’s deepest thoughts in between the lines. On the melancholic ‘What A Heavenly Way To Die’, he longingly chimes “Because forever is in your eyes / But forever ain’t half the time”; while the feral confessional ballad ‘Animal’ holds nothing back, professing “An ode to the boy I love / I’ll die to care for you”. It seems that Troye’s steadfast decision to live his complete truth has led to even more doors opening in what is already a tremendous year for him, which includes performing to a crowd of 60,000 alongside Taylor Swift, and countless magazine covers. It’s safe to say that 2018 is a year of growth for Troye Sivan, as he continues to tackle new projects in his ever-expanding resume. And in that growth lies the constant underlying message of acceptance and positive change, proving that he isn’t just in bloom; he’s full on blossoming into the perfect role model for the new generation. Get Troye Sivan’s new album Bloom here. 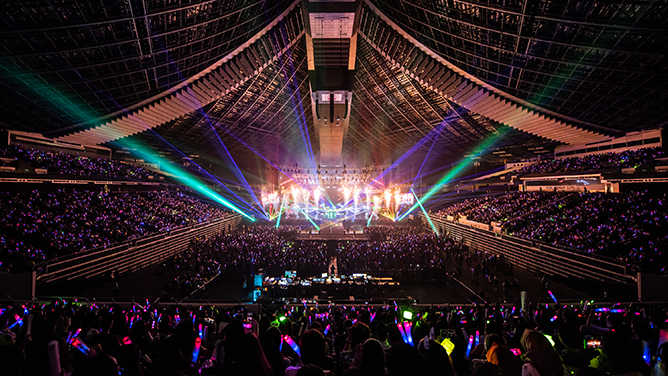 From 7 to 9 September, more than 25,000 festival-goers packed into Singapore Indoor Stadium to catch their favourite idols at HallyuPopFest (HPF) 2018 – a first-of-its-kind music extravaganza that played host to over 100 K-pop stars, featuring a star-studded roster of powerhouse acts like Wanna One, NCT 127 and EXID alongside rising rookies like UNB, Gugudan and Dreamcatcher. There was never a dull moment throughout the three-day festival, as fans were treated to an electrifying lineup of crowd-pleasing performances during the evening concerts. Although the audience was made up of varying fanbases from all walks of life, it was a heartwarming sight to see fans waving the glowing HPF lightsticks in unison to the beat – proving that music is truly universal. And that was when we realised, this is really what K-pop’s all about. Kicking off the set was Korean-American heartthrob Eric Nam, whose showmanship was on full display as he delivered a solid performance of his latest hits ‘Potion’, ‘Don’t Call Me’ and ‘Honestly’. As the appointed emcee of the show, it came as no surprise how comfortable Eric was on stage – commanding complete attention with his flawless vocal delivery and effortless stage presence. Just when we were left wanting more, VICTON took over with their infectious dancehall banger ‘Remember Me’. Although they are only two years into their debut, these hot-blooded lads certainly don’t lack in any department. Talent? Loads. Enthusiasm? Bring it on. We’re especially pleased with their well-timed ad-libs, which scored ’em plenty of charisma points in our books. Bonus: they also performed a killer cover of ‘Go Go’. BTS would be proud! Cheers then erupted as MOMOLAND got everyone hyped up with their infectious earworms ‘BBoom BBoom’ and ‘BAAM’. Despite being one member down due to Ahin’s leg injury, the ladies still put on an energetic performance for their fans. We sure hope Ahin recovers soon! Slowing down the pace, ballad legend Huh Gak descended onto the fog-shrouded stage for an emotional rendition of ‘Hello’, leading the audience into a mass singalong session. Not only was it memorable to us, it became a night to remember for Huh Gak too. “Instead of giving you a gift, I feel like I’m receiving [it] from you instead,” he tearfully thanked fans at the end. Huh Gak’s labelmates Apink were next, and they definitely didn’t disappoint. After performing their recent comeback track ‘I’m So Sick’, the girls proceeded to treat fans to a slew of throwback bops such as ‘FIVE’, ‘Mr. Chu’ and ‘No No No’. It was at this moment that all the Wannables in attendance whipped out their nable bongs, eagerly anticipating the boys of Wanna One to make their grand entrance. 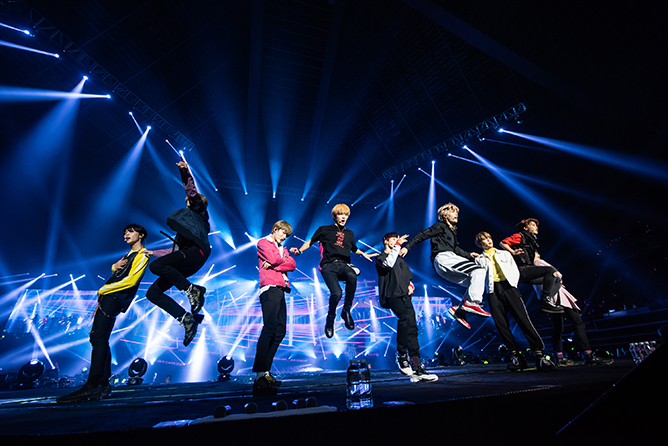 And boy, did they enter with a bang – captivating the crowd with high-energy numbers like ‘Energetic’, ‘Boomberang’ and ‘Light’. Even though some of the members were noticeably not in their best form due to their hectic schedule, their professionalism is nonetheless worthy of praise. With songs as catchy as ‘Bingle Bangle’, ‘Excuse Me’ and ‘Heart Attack’, it’d be hard not to groove along to AOA. Our resident summer queens brought the atmosphere up a notch with their breathtaking visuals (don’t even get us started on how gorgeous Seolhyun looks IRL) and sizzling choreography. Our favourite set of the night, EXID won us over with their girl crush vibes as they heated things up with their trademark sultry anthems ‘DDD’, ‘Hot Pink’ and ‘Up & Down’. 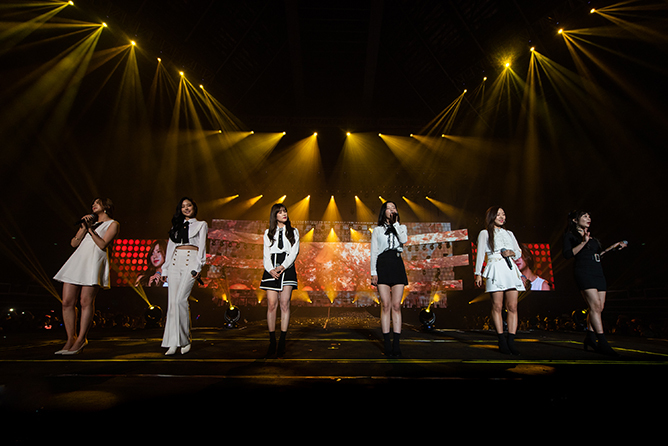 This marked Solji’s return to the group after a two-year hiatus due to a serious thyroid disease, but the quintet showed no signs of losing any edge and came back stronger than ever. Making a comeback as a full-fledged solo star, former SISTAR member Soyou showed that she’s more than capable of holding her own. Besides a special collaboration stage of ‘Some’ with labelmate Jeong Sewoon, the vocalist also surprised fans with her version of SISTAR classics like ‘Ma Boy’ and ‘I Swear’. All the feels! 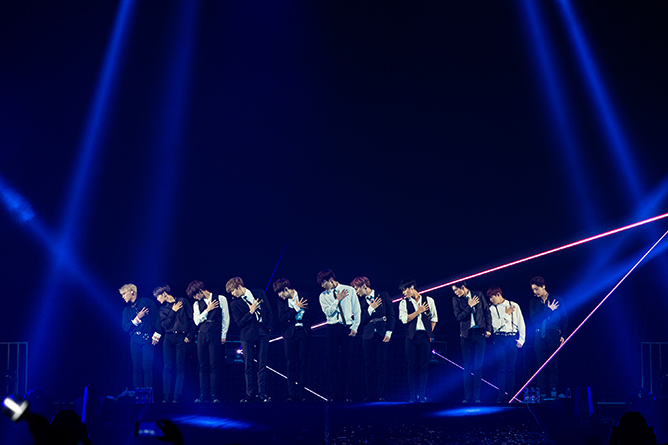 Performing for two nights straight had evidently taken a toll on Wanna One – Guanlin was seen with shades on, Daniel was spotted coughing throughout, and Jisung had to run backstage a couple of times – but that didn’t stop the 11-member group from giving their all for their closing set. Their setlist remained mostly similar to the previous day, but with the addition of slower numbers like ‘I’ll Remember’ and ‘I.P.U’, much to the delight of fans. The third and final day of HallyuPopFest boasted argubably the most well-rounded lineup of all. 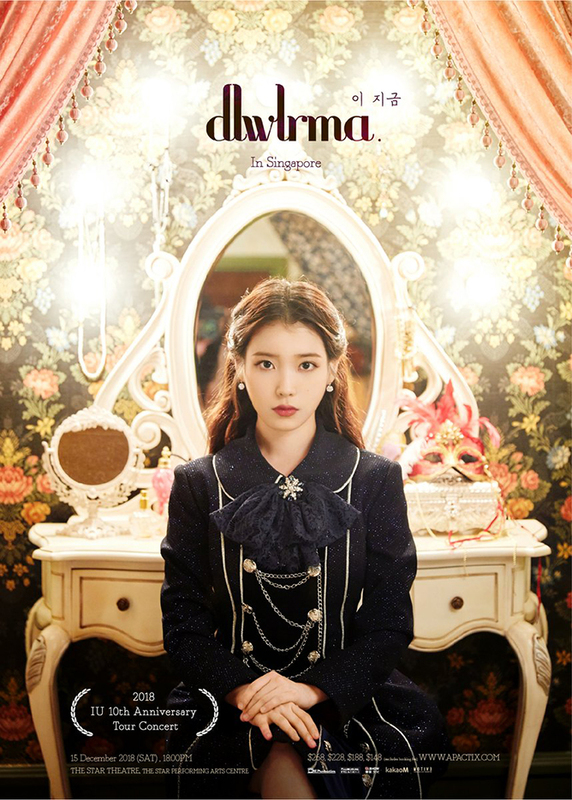 Although there was a mix of veteran and younger artistes, each group was stellar in their own right – nobody overshadowed anyone, and that’s a tough feat to achieve in such a large-scale festival. Firing up the crowd right from the get-go, UNB brought the house down with a brilliant remix of Alessia Cara’s ‘Stay’ followed by a seven-song set of fan favourites like ‘Feeling’, ‘Ride With Me’ and ‘Black Heart’. Perhaps it’s because of their tough beginnings (context: UNB is a project group made out of idol underdogs through the survival programme The Unit), but it’s obvious they poured their hearts into every ounce of their set, which made them all the more endearing. At first glance, Heize may look like your typical ice princess – but beneath her cold exterior lies a gentle heart, and a big voice. Halfway through her set, she made a dash towards the extended stage and adorably cooed over the fanboards she spotted in the front rows. What a sweetheart! 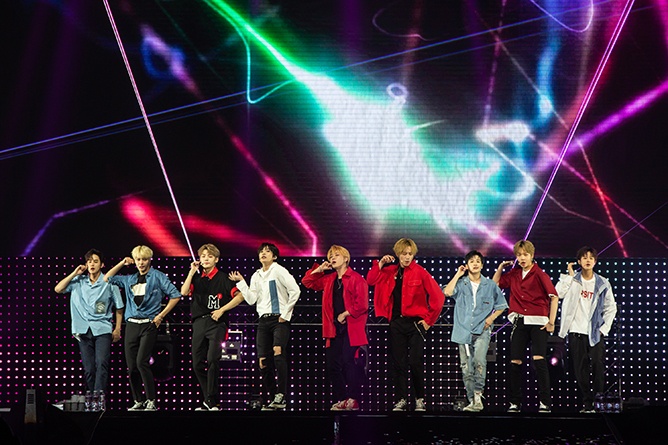 NCT 127 brought some serious swagger to the stage with their blistering set of hip-hop anthems such as ‘Limitless’, ‘Firetruck’ and ‘Cherry Bomb’. The nine-member unit commanded the loudest cheers that evening, and deservedly so. When it comes to BTOB, their live vocals are the real deal. No such thing as lip-syncing here; these guys can belt out a tune just as well as they can slay a move. Their musical ability aside, there’s no doubting their camaraderie either. When they were not busy fooling around with each other, they never failed to include Eunkwang in their conversations – and even asked Melodies to yell a collective “Fighting!” for their precious leader, who had just enlisted in military service. Finally, it was Taeyeon’s time to shine. Despite being a one-woman show without her Girls’ Generation members, just her soulful vocals was enough to fill the stadium. But she was never alone, as she was joined by SONEs in the crowd who were swaying their pink lightsticks and crooning along to every word of her five-song set. That’s a wrap for HallyuPopFest 2018. For those who missed out on the red carpet action, check out the highlights here. See you next year!